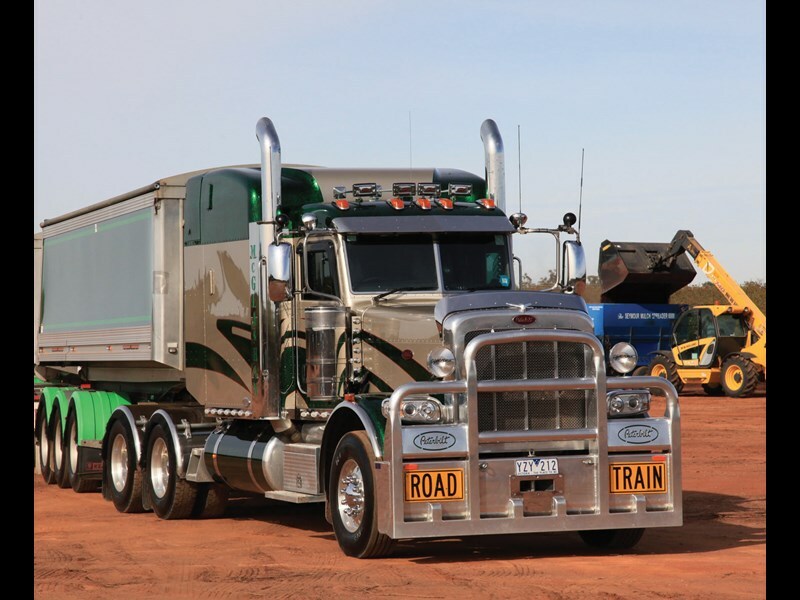 The Peterbilt, known as the ‘owner-driver’s truck’, remains a rare beast on Australia’s roads, which probably adds to its air of mystique. Warren McGlashan is one who appreciates the prestige of the Peterbilt. 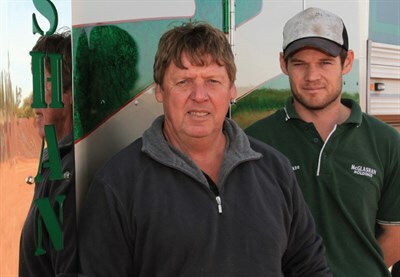 Warren runs a fleet of six trucks out of Mildura — three Kenworths, a Freightliner, a Mack and an as-new Peterbilt 388. Until recently, Warren’s preference was to buy secondhand trucks, and then run them for a couple of years. 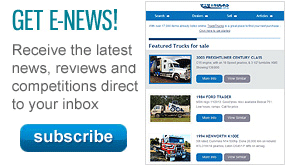 "They cost a bit less and there’s no way of picking my trucks from new ones. All my trucks go straight to Modern Towing in Melbourne for painting and signwriting," Warren explains. The Peterbilt is Warren’s regular drive and it certainly attracts plenty of attention with its distinctive paint scheme. He bought it from American Truckworks at Wingfield in Adelaide. It was a cancelled order and Warren considers the Pete a good buy. "A lot of people want to talk about the Pete and they inevitably want to have a look inside," he smiles. "But they can’t pick the conversion. "The Pete is a very classy truck, it’s comfortable and easy to drive for a big truck. It’s a driver’s truck and so well put together." Warren’s business McGlashan Holdings has only been in the tipping game for four years. Most of the tippers running around Mildura come off farms with the operators having had tippers for a long period of time. However, Warren has been carrying grapes for 21 years, with the majority of the fleet contracted to deliver the fruit to Griffith in the Riverina district in New South Wales. "We run four tipper road trains and have up to nine subbies," he says. "I think we are the only ones using tippers; everyone else uses bins. "We had 300 bins and used them for about eight weeks and then changed to tippers which saved around 4 to 5 tonnes in tare weight over a road train. "It was my son Shane’s idea; he pushed for it and it has worked extremely well." As 90 per cent of McGlashan’s work is in NSW, Warren is aware of the importance of keeping that state’s authorities happy. "If you do the right thing, all is good," he states. "We have not had one issue with the authorities. "A few drivers have been told to back off and they don’t have any hassles going over the Hay Plains. "During the grape season, our trucks are going over and back Monday to Friday. We do the right thing, but I tell my drivers to take it steady." The McGlashan trucks all run clean with the speed set at 100km/h. It’s a six-hour run across and a little quicker coming home, but it’s all done legally with each driver having the correct amount of time off. "We’re loading all the time," Warren says. 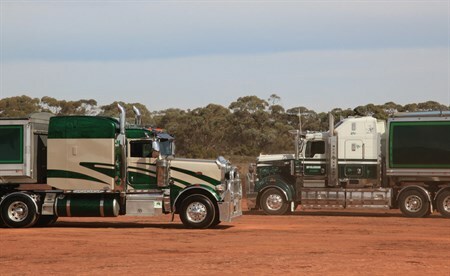 "We use the BP at Gol Gol as a base for our road train changeovers, the drivers drop them off, we jump in, fuel and load them ready for the run back to Griffith. This allows our drivers to get home for a good break." During harvest time Warren’s wife, Heather is hands-on. Together with the subbies, they can load up to a dozen road trains each night. "Heather organises all the trucks and takes the orders while Shane and I are on the loaders. 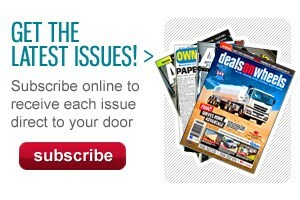 She also takes care of all the paperwork," Warren says. "They might want 10 trucks on any given night, so we get the drivers and subbies organised. "It sounds like a lot — and it is — but they don’t all lob home at the same time and over the years we have got it down to a fine art." Using tippers is not only more efficient, it allows the business to diversify. Last year Warren had one of hisB-double’s hauling almonds, and next year he says he will have at least two on the job. The McGlashan road trains also follow the grain harvest up into Queensland, hence the big bunks in the trucks. "The grain is a six to eight week season and we live in the trucks. They have TVs and microwaves and this is where the Pete’s bunk is wonderful," he smiles. Aside from the Peterbilt, the newest truck in the McGlashan fleet is a Kenworth T909. Shane McGlashan is the 909’s regular driver. "Looking at McGlashan’s 904 and the 909 there is no comparison," Warren says. "They are very different trucks. The 909 is a great truck but Peterbilt make a great product as well. "Shane prefers the Kenworth and I’m happy in the Pete. They are a similar truck in that they’re both easy to maintain and service, and they both have the same Cummins ISX engine." The McGlashan name has been involved in trucking in Mildura since the 1960s. Warren’s father, Tom McGlashan and his uncle Stan operated a freight service that ran to the major capital cities. The company ran a few Diamond Reds but were known for their green Macks. They operated a lot of B models and Flintstones and were eventually bought by United Transport. Both Tom and Stan McGlashan were inducted into the Shell Rimula Hall of Fame at Alice Springs in 2010. Looking at the future, Warren thinks that it’s reasonably positive. A couple of good seasons mean growers have been getting slightly better prices for their grapes. In addition, regulations relating to the access of road trains around Mildura have recently changed with more roads in and around the regional city being opened up to the larger configured trucks. "The Mildura Council did a good thing opening up the whole Mildura region to B-doubles and now they are starting to do the same with road trains," Warren says. "With all the fruit and grains that are grown around the district, it all needs to be moved. We are very isolated up here and they say that Mildura was built by the little grey Fergy tractors and trucks." Meanwhile, McGlashan’s trucks continue to get positive feedback, both through the colour scheme and the reputation of the business. "We are continuing to grow," Warren says. "We have a great bunch of operators and good equipment, so we hope to consolidate and grow as and when the opportunities arise."